Please click on the evolution of the Cubs uniform poster above for a close-up version of the poster. The descriptions below give you some insight and background about the uniforms and/or eras depicted in the poster. 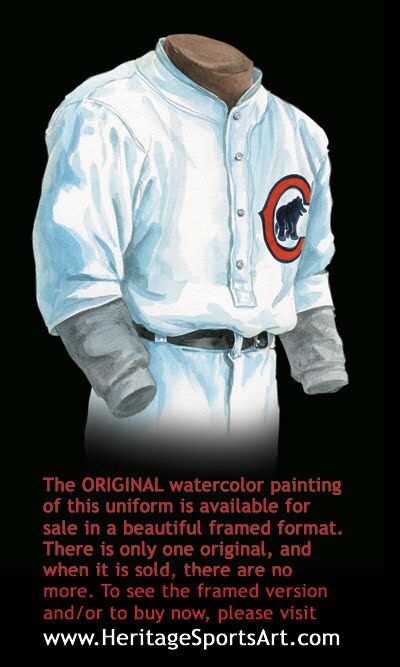 In 1876, the Chicago White Stockings (yes - the Cubs used to be called the White Stockings!) become one of eight charter members of the National League. On April 25, 1876 the team plays the first game in the history of the Chicago National League Ball Club. A.G. Spalding doubles as the manager and pitcher, and he records the first NL shutout, a 4-0 win over Louisville. The White Stockings go on to win the inaugural National League championship with a record of 52-14. Using nicknames such as the "White Stockings," "Colts," and Orphans," the team plays in five different ball parks in the 1800s. The origin of the name Cubs isn’t precisely known, but one story has it that in 1901 and 1902 the team was full of rookies and on March 27, 1902 a reporter in the Chicago Daily News referred to the team as the “Cubs”, a name that eventually stuck. 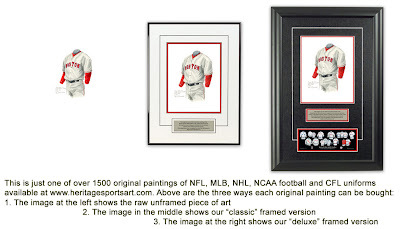 The jersey depicted here is a 1908 home jersey with a full pull-down collar. The logo is a brown bear standing on its hind legs holding a bat. Even though this jersey has several buttons down the front, it still was a “pullover” style jersey that had to be pulled over top of the head. In 1908, for the third year in a row, the Cubs headed to the World Series. In 1906 they fell to the cross-town rival White Sox; while in 1907 they won four straight over the Tigers. In this season, 1908, the Cubs and Tigers met again, with the Cubs winning the World Series 4 games to 1. Even the presence of Detroit’s legendary Ty Cobb wasn’t enough to overcome the Cubs of the early 1900’s. In the 1908 Series Cobb was held to just 4 hits and 2 stolen bases in the 5 games, as the Cubs went on to become the first team to win back-to-back World Series Championships. The Cubs have had a dry spell since 1908, but despite this drought, Cubs’ fans are ever hopeful and remain among the most loyal fans in all of baseball. 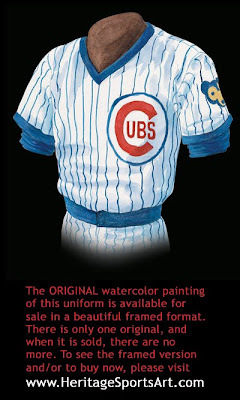 The Cubs are one of the first major league teams, (along with the Boston Braves & Brooklyn Dodgers) to implement pinstripes as a part of their uniforms, a practice that actually began with their 1907 World Series uniform. The 1909 collar on this road uniform is cadet style. Note also the “CHICAGO” down the front of the jersey - a wonderful touch we’d love to see repeated by a modern team. Just like the 1908 jersey, there are buttons down the front of this jersey, but it’s still a “pullover style” jersey. 1909 is the first year that the Cubs had a large “C” with a smaller “ubs” inside of it. 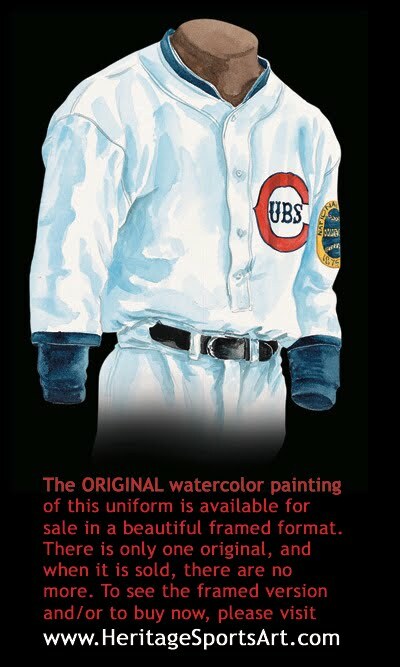 This jersey is from the Cubs’ most successful era, when they made it to the World Series 4 times in 5 years, (1906, 1907, 1908 & 1910) winning it all in 1907 and 1908. The collar on this dark blue road jersey is halfway between a cadet style and the style of today. This is a pullover style jersey, even though it has some buttons down the front, it still had to be pulled over the head. 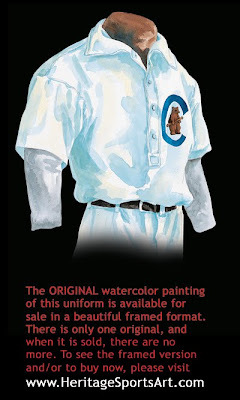 A white bear inside a white “C” appears on this jersey, slightly different than previous logos, but the theme remains the same, a bear and a bat. Note also how there is a center belt loop and how the belt buckle is worn to one side. Players of this era usually wore the belt buckle to one side to prevent injury when sliding into a base. 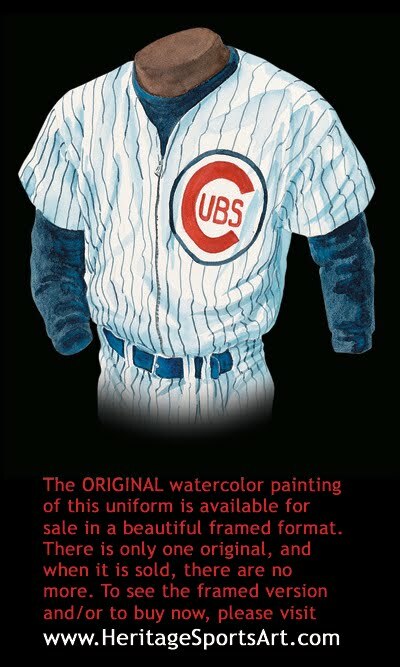 The logo changes once again on this home uniform, now it’s a red “C” and a blue bear on all fours. The 1916 season is of great interest to Cubs fans because it was the first year the Cubs played in what we all know now as “Wrigley Field”. Prior to 1916 the Cubs played their home games at the West Side Grounds. In 1916 Charles Weeghman purchased the team & moved them to “Weeghman Park” for the 1916 season. This ballpark had been built two years earlier and was home to the Federal League’s Chicago Whales until the League folded in 1915. The first National League game played at Weeghman Park was on April 20th, 1916 when the Cubs beat the Cincinnati Reds 7-6 in 11 innings. The Cubs were sold to William Wrigley in 1920, & the park was renamed “Cubs Park”. Then in 1926 the name was changed to Wrigley Field, the name we know and love today. This home uniform is still a pullover style jersey with a cadet collar. They stuck with the large red “C” and went with the “ubs” inside of it, similar to the 1909 logo. The patch on the left sleeve commemorates the 50th anniversary of the National League. On April 14th, 1925 the 1st regular season radio broadcast of a Cubs game hit the air on WGN Radio, with Quin Ryan calling the play by play. Chicago beat Pittsburgh 8-2. Most baseball fans know that teams typically wear the name of their city on their road uniforms and their nicknames for their home uniforms - this has been done for over 100 years. What makes this jersey interesting is that only a handful of Major League teams have ever worn a jersey with both the team’s city AND nickname appearing on the same jersey, such as is the case here. 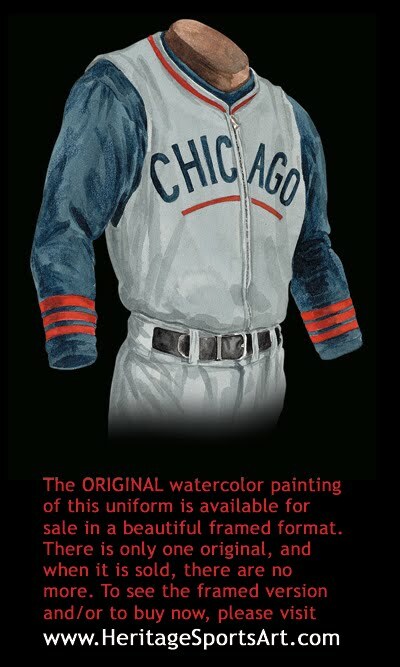 The Cubs wore this pullover style road uniform for the 1932 and 1933 seasons. In 1932 the Cubs made it to the World Series and thus faced Babe Ruth and the New York Yankees. In Game 3, October 1st, the story is told that while The Babe was at bat in the 5th inning, he paused, pointed to the right-centerfield bleachers, and “called his shot”. The next pitch ended up in the seats where he had predicted. The Yankees swept the Series in 4 games. On a sad note, both former owner Charles Weeghman & then-current owner William Wrigley passed away this year. Wrigley’s son Philip Knight, “P.K.” took over for his father. 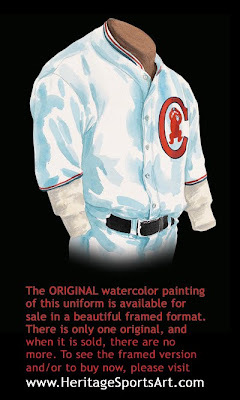 We here at Maple Leaf Productions had originally painted this uniform with blue lettering and blue piping based on the initial research findings of baseball historian Marc Okkonen, but Mr. Okkonen and MLB subsequently revised the color of the lettering and piping from blue to red, and we have thus updated our more recent products to reflect this change. 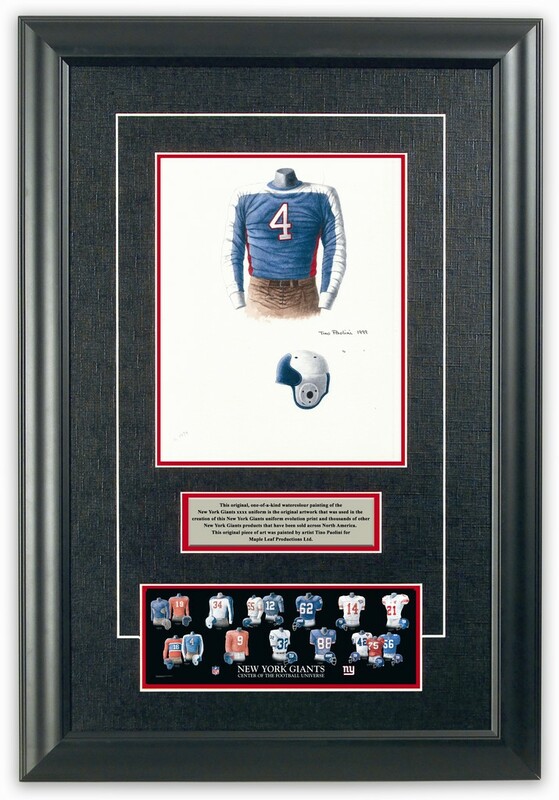 This is a full button-down front home uniform (as opposed to the pullover style jersey) with distinctive red and blue piping around the collar and cuffs. The logo is a bear cubs winding up to pitch, but we have to admit it looks as much like an ape as it does a bear. The Cubs made it to the World Series 3 times in the 30’s but were defeated by the Yankees in 1932, the Tigers in 1935 and the Yankees again in 1938. A1930’s point of interest: In September 1937 Bill Veeck planted the ivy that now covers the brick wall of Wrigley Fields’ outfield. The ivy has become synonymous with Wrigley Field, & gives outfielders a second thought about tracking a fly ball to the wall. Notice also the zippered front on this road uniform. The 1937 Cubs were the first team to wear a zippered jersey, with the White Sox and Tigers joining in the following year. During the 40’s, 50’s and 60’s many teams used zippered jerseys instead of the more traditional button front jerseys, while a handful of teams wore them well into the 70’s and even the 80’s. The Reds, Yankees and A’s were the three pre-1977 major league teams that never wore zippers. As mentioned above, the 1937 Cubs were the first team to wear a zippered jersey, and as far we can tell the 1988 Phillies were the last to wear one. Perhaps the most unusual part of this jersey is the uniformly thin underline under the “Chicago”. Usually baseball uniforms feature more of a “swoosh” underline, like the 1932 jersey. It’s interesting to note that in 1940 Wrigley Field was about to become one of the first ballparks with lights, to allow night games, but when World War II began, the team donated them to the war effort. As it turns out, the Cubs ended up being the last team to get lights, & played their first night game at Wrigley in 1988. This is a classic uniform, one of our favorites! 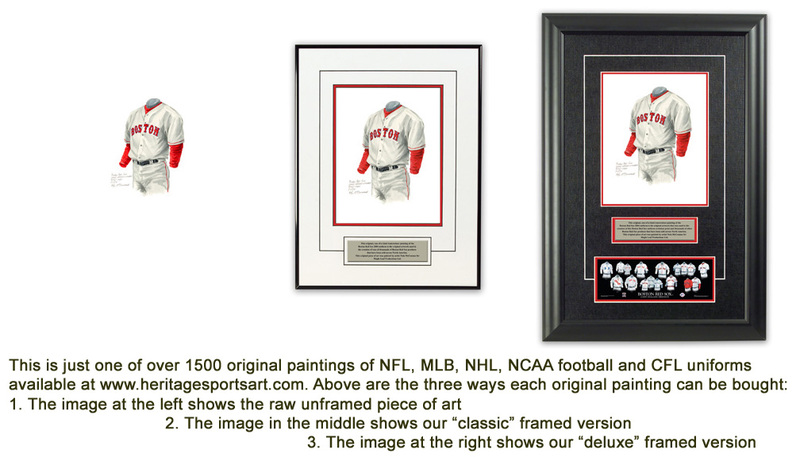 Note that the red stripes on the cuffs of the undershirt are still present (see the 1940 jersey). Wartime sleeve patches were worn by all levels of professional baseball teams between 1942 and 1945. A “Health” patch was worn during the 1942 season, part of a war-time health and fitness awareness campaign, and from 1943-1945 a “Stars and Stripes” was worn. Now we have to fess up - some of our early-version Cubs’ posters show the “Health” patch on the 1945 uniform - this wasn’t the case, we should have shown the Stars & Stripes patch. As noted above, the health patch was only worn in 1942. If you have one of our early posters, sorry for the mix-up! In 1945 the Cubs made it to the World Series, but fell to the Tigers 4 games to 3, losing to the Tigers at Wrigley Field in Game 7 by a 9-3 score. The Cubs have to wait until 1984 to make it back to post season play. 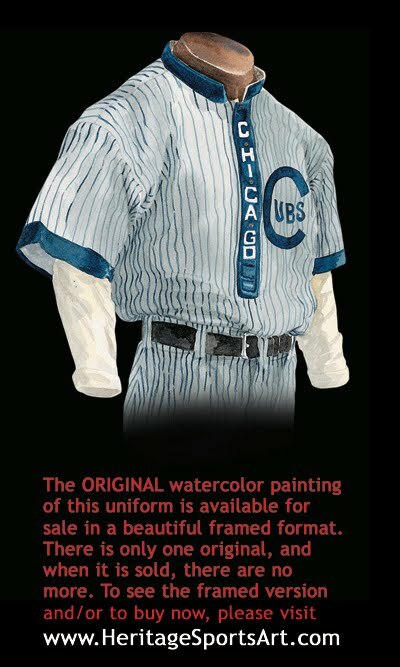 In this home uniform we see the first appearance of pinstripes for the Cubs since the early 1930’s. 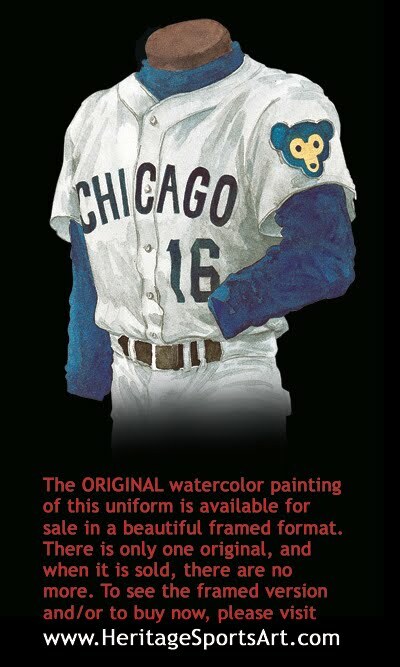 Notice the Cubs logo and how similar it is to that of today. By 1957 the great Ernie Banks, Mr. Cub, was playing his 5th season, batting .285 and knocking in 102 runs. Numbers are added to the front of this road jersey for the first time. Uniform numbers first made their appearance on the front of a uniform in 1952 - the Brooklyn Dodgers were the first team to wear uniform numbers on the front of their jersey. The Braves followed suit in 1953, and the Reds joined in beginning in 1956. 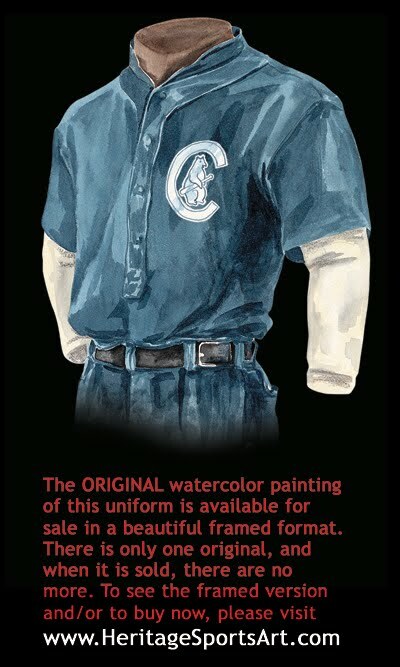 The 1916 Cleveland Indians actually wore a uniform number on their sleeve, but it wasn’t until the ’52 Dodgers that the number made it to the front. The Cub face patch seen on the left shoulder made its first appearance in 1962. 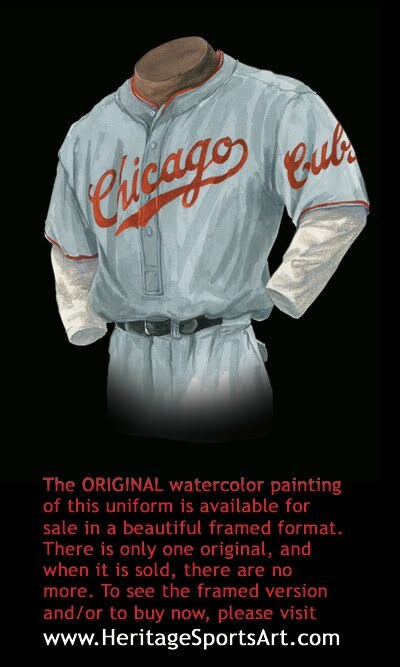 If we could see the right sleeve of this jersey, we would see a patch worn by all MLB teams that commemorated the 100th anniversary of professional baseball. 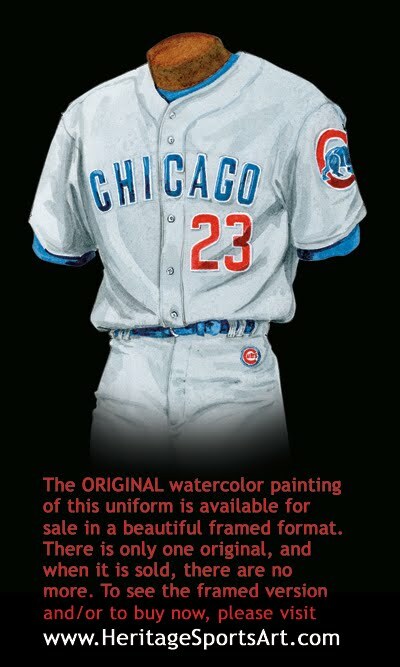 When I see this jersey, I can’t help but think of two great Cubs - shortstop-turned first baseman Ernie Banks and the great Ferguson Jenkins, who had six 20+ game winning seasons in a row with the Cubs from 1967-1972. This home jersey is of a double-knit style that most major league teams succumbed to during the 70’s and early 80’s. It was a pullover style, made of stretchy, synthetic material. The pants were called “Sans-a-Belt”’s because the elasticized waistline eliminated the need for a belt. This was a successful era for the Cubs, who finished either 2nd or 3rd and above .500 for 6 straight years (1967-1972), but could never quite make it to post season play. This road uniform is still the double knit pullover style, with the “Sans-a-Belt” elastic waistline. Notice the new bear patch on the left sleeve. 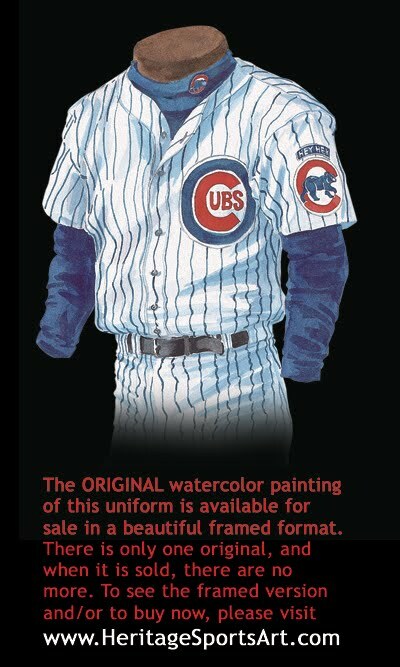 The patch on the right sleeve celebrates the fact that the Cubs were the National League Eastern Division Champs (they finished with a 96-65 regular season record) and made it to the post season for the first time since 1945! But in the National League Championship Series against the Padres, the Cubs win the first two games to take a commanding 2-0 lead in the best-of-five series, then drop the next 3 games (all in San Diego) and fail to make it to the World Series. Thank goodness - by now the double knit, Sans-A-Belt era has finally come to an end! Grown men shouldn’t have to play ball in polyester! This 1990 road uniform has the uniform numbers on the front once again. 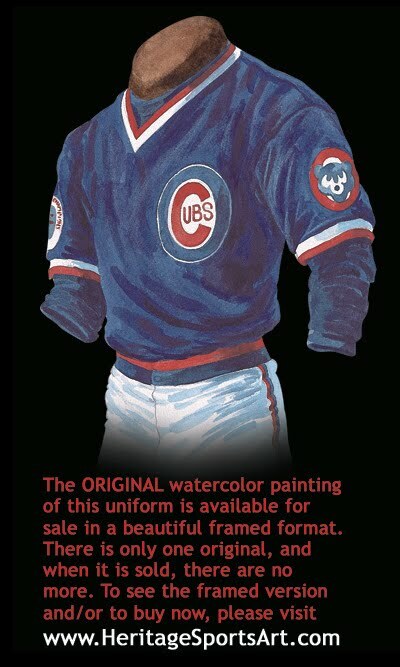 The familiar Cubs logo as we know it today is on the left sleeve. 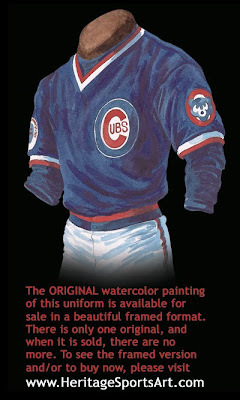 The right sleeve has a patch that the Cubs wore all season long. This patch commemorates the fact that the Cubs & Wrigley Field played host to the 1990 All Star game. This practice, where the team which hosts the all-star game wears a patch commemorating the game, began in the 1970’s and continues today. 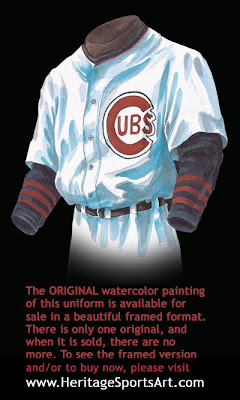 This home uniform shows a circle C and walking bear logo on the left sleeve, a logo that is reminiscent of the 1916 jersey logo. Note also the fact that there is a blue and white “Hey Hey” on the left sleeve just above the bear logo. We had mistakenly presumed this was an expression used by Cubs longtime announcer Harry Caray, but in fact Cubs superfan Steve Goodman tells us it was coined by Jack Brickhouse, the longtime Cubs announcer who preceded Harry Caray. Brickhouse would say “It's back, back, it could be... HEY HEY!!!!!'. In this famous season, 1998, Sammy Sosa of the Cubs and Mark McGwire of the Cardinals battled head to head in an awesome home run race that captured the attention of a nation and may have helped to revitalize the entire sport of baseball. It could be argued that the uniforms of the Chicago Cubs and the St. Louis Cardinals were the most photographed jerseys in the entire history of professional baseball as McGwire slugged 70 home runs to Sosa’s 66 - a feat that may not be repeated in our lifetimes. In 2003 the Cubs hired former Giants skipper Dusty Baker to be their manager following a disappointing 2002 season where they posted a 67-95 record. Baker took over for Bruce Kimm, who took over for Dan Baylor after he was fired mid-way through the 2002 season. On the north side of Chicago the 2003 season opened with renewed hopes that the club would be able to end their 95-year World Series drought. The Wrigley Field fans had good reason to get excited about the season: they had a new manager, while on the field the team added 1B Eric Karos, SS Alex Gonzalez and OF Kenny Lofton to become much stronger defensively and they had Kerry Wood and Mark Prior who were quickly establishing themselves as the best starting pitching duo in the NL. RF Sammy Sosa’s year began with a milestone watch, as the Cubs slugger needed just one homer to reach 500 for his career. Sosa would achieve that goal on the 4th day of the season going deep, on the road, in the Cincinnati Reds’ new ballpark. Shortly after he hit #500 Sammy began to struggle and in May was placed on the disabled list. Sammy would go on to hit a respectable .279, 40 homers and 103 RBI, but his season would not be remembered for those numbers. Sosa, trying to get himself out of his slump, began using a corked bat. And in an inter-league game versus Tampa Bay his bat exploded while at the plate and his cheating was exposed - he was later suspended. Despite this embarrassing moment, the Cubs won the NL Central with an 88-74 record. This would be the Cubs’ fourth trip to the postseason since 1945 when they played in the World Series (the three other playoff appearances since 1945 were in 1984, 1989 and 1998). The Cubbies faced the perennial NL East Champion Atlanta Braves in the NLDS and knocked them off 3 games to 2 in a hard fought best of 5 series. In the NLCS their opponents were the Florida Marlins, who won the NL Wild Card berth. The Cubs held a 3 games to 2 lead in the best-of-seven series going into game 6 at Wrigley Field. In the top of the 8th inning of game 6, the Cubs were leading 3-0 with one out and a man on 2nd, when the Marlins’ Luis Castillo’s fly ball to left appeared about to become the inning’s 2nd out. Moises Alou of the Cubs drifted to the stands and reached up to catch the ball when a Cub fan named Steve Bartman knocked the ball away, leaving Alou empty handed and incredibly angry. The floodgates were now open - Castillo would walk, which was followed by an Ivan Rodriguez single that put the Marlins on the board. Things would only get worse as SS Alex Gonzalez booted a double play ball and the Marlins went on to score 8 runs in the infamous 8th inning to force a 7th game by virtue of a dramatic 8-3 win. Not even Kerry Wood could save the Cubs in Game 7 as the Cubs ace was shaky. The Marlins took the game by a 9-6 score to go on to the World Series, leaving Cubs fans with heartbreak like they had never suffered before. To this day you could ask even a casual Cubs fan who Steve Bartman is and they will know exactly who you’re talking about. After that game, Bartman became a nation-wide celebrity for all the wrong reasons, and after some Chicago fans threatened Bartman’s safety, some Floridians offered him an opportunity to relocate to Florida. Such is baseball, and moreover, such is the history of the Cubs, who remain without a World Series title since they last won in 1908 (their only other World Series win was in 1907). 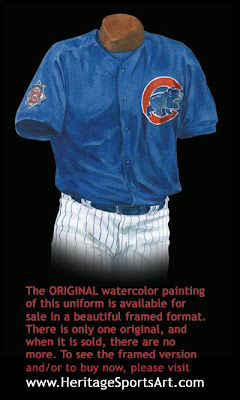 In 2003 the Cubs wore an alternate dark blue jersey that was worn both on the road and at Wrigley Field. 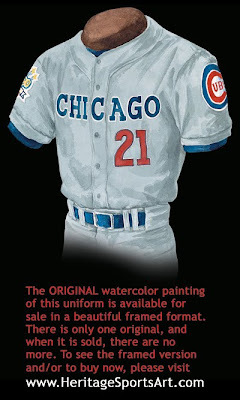 The traditional Cubs logo is found on the upper right of the front of the jersey and in a rather unique move, a National League patch is on the right sleeve. This jersey is what is referred to nowadays as a “3rd jersey”. 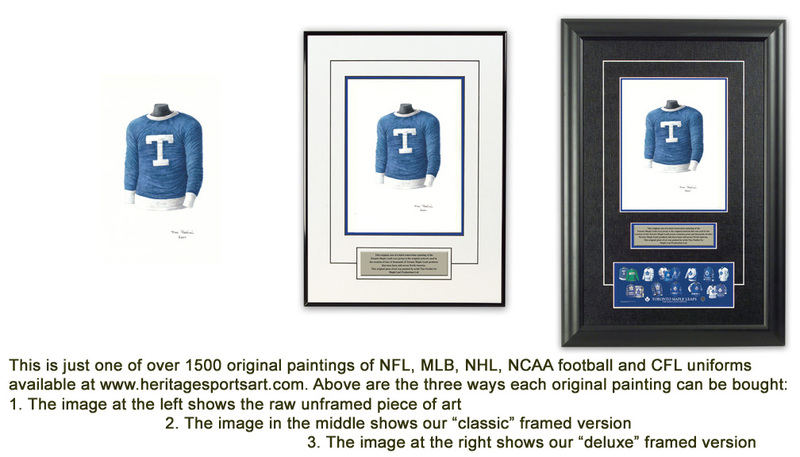 A 3rd jersey is a concept that became commonplace in baseball and hockey in the 1990’s, and in the 2000’s in the NFL. Most 3rd jerseys are worn occasionally at home as well as on the road, giving a team a third option as to what uniform to wear. And of course, the addition of a third jersey adds to the options fans can buy, thereby increasing apparel revenues and ultimately benefiting the team. More recently, baseball and hockey teams have begun adding 4th and even 5th jerseys to their roster of uniform possibilities, a bit of a frightening trend to those who like to be able to tell the home team from the road team by seeing the teams’ uniforms. This classic, beautiful road gray uniform celebrates the 2008 Cubs who won their second straight National League Division Title under the leadership of manager Lou Pinella. In 2007 the Cubs went 85-77 to win the crown, then in 2008 went 97-64. Hopes for an all Chicago World Series (the White Sox won the AL Central Division) were dashed when the Cubs lost the NL Division Series 3-0 to the Dodgers and the White Sox lost 3-1 to the Tampa Bay Rays in their AL Division Series. Two highlights of the year for the Cubs were the no hitter thrown Sept 14/08 by Carlos Zambrano and the play of catcher Geovany Soto who won the NL’s rookie of the year. This is terrific. Nicely done.